Next, add avocado for creamy texture and richness that balances all the lighter elements you're piling on. Finish the whole thing with convenient jarred roasted red pepper, a few slices of crispy cucumber, and a shot of grassy, fragrant chives. Season, sandwich, grill, and devour. Grilling isn't strictly necessary, but the pressure really boosts cohesion, and the toasted bread adds welcome texture. Speaking of bread and texture, be sure to choose a nice, thick, hearty loaf that will stand up to your filling (and grilling). This guy will also make a great picnic sandwich served on baguette—see the note in the recipe below. Rinse the chickpeas in a sieve and set aside to let drain thoroughly. Meanwhile, cut pepper into 1/2-inch-thick strips and set aside. Finely chop chives and set aside. Thinly slice cucumber and set aside. Use a fork to mash avocado with 1 tsp lemon juice and a generous pinch salt. Set aside. Chop parsley leaves so that no large leaves remain. Use a potato masher to mash chickpeas, parsley, olive oil, generous pinch salt, and 1 TBSP lemon juice until chickpeas are broken up. Heat a closing countertop electric grill. To assemble one sandwich, take two slices bread. 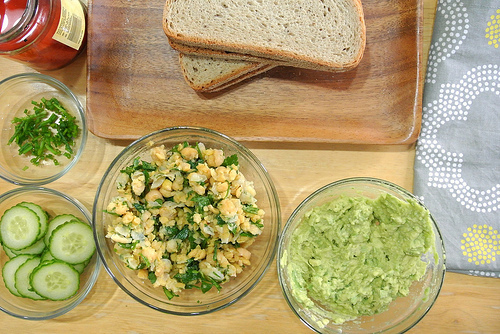 Add one-quarter of the chickpea salad to one slice and one-quarter of mashed avocado to the other slice. Atop the chickpeas, add pepper slices, chives, and cucumber slices. Sprinkle a generous pinch each salt, pepper, and dried oregano over the mashed avocado. Sandwich, grill until browned (about three minutes), and serve immediately. Repeat with remaining ingredients. Picnic Variation: Assemble sandwiches using baguette. Do not grill. Wrap each snugly in parchment paper. Stored this way, sandwiches will keep well for 2-3 hours.